An Anchor care home, Mill View in Bradford, has raised over £1,000 so it can open its latest unique project for its residents – its very own beauty parlour. Mill View has successfully fundraised for five other projects in recent months including a shop, library, 1950s retro diner, a cinema and a pub. After a very successful day last week, the sixth project a beauty parlour has now officially opened. And what better way to get people excited than putting on a Mad Hatter’s Tea Party. 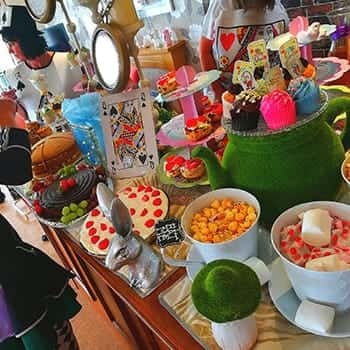 Mill View Manager Tee Tatum, who helped organise the Tea Party, said: "After weeks of planning, making, decorating and dressing up, our “Mad Hatters Tea Party" in celebration of Anchor’s 50th Birthday has just taken place and was a huge success. "We served over 150 mad hatters including guests from local companies, Anchor colleagues, sponsors, family, friends, district nurses, GPs, Bradford’s mental health team, scouts, brownies you name it, they all came. And furthermore, they all came dressed up in their fabulous Alice in Wonderland costumes. "My team were amazing and produced a fantastic afternoon tea, created unbelievable costumes and most importantly, our residents had a day to remember. We also managed to raise just over £1,000 to pay for what we secretly called “Project Number 6”. And for those of you who are interested in contributing to Number 7, we have already started with our barber’s shop. "May I just offer a really big thank you to all our sponsors and everyone who came who made the day so memorable." Photo shows administrator Jane Raw, cleverly disguised as The Ace of Spades from Alice In Wonderland, surveying the amazing display of goodies at Mill View’s Mad Hatter’s Tea Party.